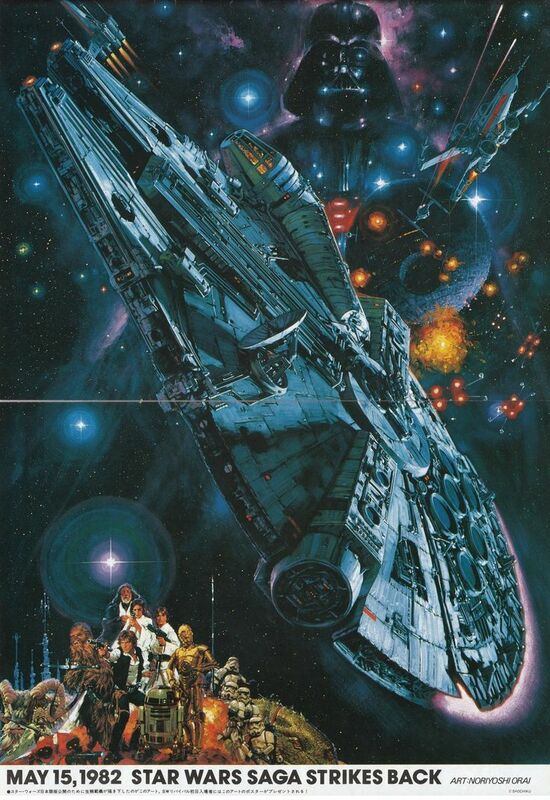 My Favorite Star Wars Episode IV poster, with the Millennium Falcon appropriately cast as the hero, didn’t come out until 1982. It’s by master artist Noriyoshi Ohrai for the 1982 Japanese re-release. Ohrai also did exquisite posters for The Empire Strikes Back, The Road Warrior, The Goonies, and The Beastmaster, all of them equaling or bettering their American counterparts, in my opinion. He is accomplished in paperback, toy and game illustration as well. Inexplicably, he has no American fan site that I can find. You can see many of Ohrai’s posters, including the Heisei-era Godzilla beauties, at Film on Paper. See his Road Warrior (Mad Max 2) poster at Pinterest. 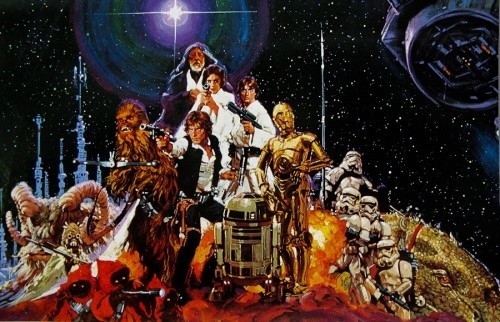 The Star Wars (1982) poster is via Pinterest and Film on Paper (detailed views available). I’ve never seen this – that is an exceptionally gorgeous poster! You’ve seen the Empire poster. That one was used in the U.S.
wow dood, that image just gave me chills. I’ve never seen that before. The arrangement of the images is just exquisite…that Millennium Falcon looks freakin’ HUGE—I totally get the impression of its size and its delicate balance in zero gravity. Its angle causes just enough tension without being awkward (which it would be if it were off just a few degrees). I think that’s why it gave me chills, with that tension. Ohrai nails it right there. I think this was done for the film’s first release in Japan dubbed in Japanese, as the film was originally shown there with Japanese subtitles. Beautiful work.